Previous studies reported the risk of ESRD after kidney donation, but not the renal outcomes that precede ESRD. Here, we estimated the risk of proteinuria, reduced GFR, and ESRD in 3956 white kidney donors, assessed the contribution of postdonation hypertension and diabetes to these outcomes, and developed a risk calculator. After a mean±SD follow-up of 16.6±11.9 years, 215 (6.1%) donors developed proteinuria. Men had a higher risk of proteinuria (hazard ratio [HR], 1.56; 95% confidence interval [95% CI], 1.18 to 2.05; P<0.001) as did those with higher body mass index (HR, 1.10; 95% CI, 1.06 to 1.13; P<0.001). In all, 1410 (36%) donors reached an eGFR<60 ml/min per 1.73 m2, and 112 (2.8%) donors had either an eGFR<30 ml/min per 1.73 m2 or ESRD (28 donors developed ESRD). An eGFR<30 ml/min per 1.73 m2 or ESRD associated with older age (HR, 1.07; 95% CI, 1.05 to 1.09; P<0.001), higher body mass index (HR, 1.08; 95% CI, 1.04 to 1.13; P<0.001), and higher systolic BP (HR, 1.02; 95% CI, 1.00 to 1.04; P=0.01) at donation. Postdonation diabetes and hypertension associated with a fourfold higher risk of proteinuria and a >2-fold higher risk of ESRD. Models predicting proteinuria and reduced eGFR performed well (C-index 0.77–1.00). In conclusion, severe reduction in GFR and ESRD after kidney donation were uncommon and were highly associated with postdonation diabetes and hypertension. Furthermore, information available before donation may predict long-term renal outcomes in white living kidney donors. It is important to be able to provide potential living kidney donors with accurate information regarding long-term risks that stem from living with one kidney. Previous studies, comparing donors to the general population or to healthy matched controls, have reported on the relatively rare event of ESRD.1–3 Little attention, if any, has been paid to more common intermediate outcomes that are often harbingers of ESRD, such as the development of proteinuria or substantial decline in the GFR. In the United States, more common intermediate outcomes are not captured in the national donor registry. Moreover, that registry did not exist before 1994; therefore, true long-term follow-up postdonation is not yet possible. The University of Minnesota living kidney donor program, which started in 1963, has information on 4187 living donors—not only at donation but also for decades after. Given our regular assessment of donors’ vital and health status, ESRD requiring renal replacement therapy, and standard laboratory measurements of renal function, we can provide significantly longer follow-up than previous studies, as well as information on intermediate renal outcomes seen in donors progressing to ESRD. In our study, we analyzed data on postdonation development of proteinuria and reduced GFR, which are almost universally present on the pathway to ESRD development, and also on the incidence of ESRD. Using information available at the time of donor evaluation, we developed a risk calculator for reduced GFR, proteinuria, and ESRD. This risk calculator could be used as part of counseling potential donors and obtaining informed consent predonation. In addition, we quantified the association between the development of postdonation diabetes and hypertension and incident proteinuria, and reduced GFR and ESRD. Of the 3956 white living kidney donors in our study population, 56.7% were women and 80.3% were related to their recipient; the mean (±SD) age at donation was 39.3±11.6 years (Table 1). At donation, the mean serum creatinine level was 0.9±0.2 mg/dl; eGFR 92.9±16.2 ml/min per 1.73 m2; and body mass index (BMI) 25.8±4.3 kg/m2. In all, 382 donors died (mean age 69.8±14.2 years) at 22.7±10.3 years postdonation. We ascertained the cause of death for 313 donors (82%). In those 313 donors, death was attributed to cardiovascular disease in 28%, malignancy in 23%, infection in 3%, and other causes in 28%; it was unknown in 18%. Death during the course of our follow-up period was associated with older age at donation (for each year older: hazard ratio [HR], 1.11; 95% confidence interval [95% CI], 1.1 to 1.12; P<0.001), male gender (HR, 1.50; 95% CI, 1.21 to 1.87; P<0.001), and smoking (HR, 2.48; 95% CI, 1.98 to 3.1; P<0.001). After a mean follow-up time of 16.6±11.9 years (range 2–51 years), 3674 donors (93%) returned surveys regarding the development of diabetes, hypertension, proteinuria, and kidney disease. Respondents were more likely to be women and less likely to be smokers, but were otherwise comparable to nonrespondents. During the follow-up period, 231 donors (6.3% of respondents) developed diabetes at a median age of 56.6 years, 18.5 years after donation; 917 (26.7%) developed hypertension at a median age of 55.1 years and 13.8 years after donation; and 4.7% developed both. The results (>1 year postdonation) of urinary protein measurements or urinalysis were available in 2175 donors. Postdonation serum creatinine measurements were available in 3922 donors, including 2723 with at least one measurement >1 year postdonation, and, of these, 2057 had serial measurements. In all, 215 out of 3534 donors with available measurement or self-report (6.1%) of our living kidney donors developed proteinuria at a median age of 55.8 years and after a median of 18 years after donation. Postdonation proteinuria was associated with a higher BMI (HR, 1.10; 95% CI, 1.06 to 1.13; P<0.001) and with male gender (HR, 1.56; 95% CI, 1.18 to 2.05; P<0.001). Donors related to the recipient were less likely to develop proteinuria (HR, 0.58; 95% CI, 0.36 to 0.96; P=0.03). Of those with eGFR<45ml/min per 1.73 m2, 16.7% had proteinuria; of those with eGFR≥45ml/min per 1.73 m2, 4.9%. Of the 3956 donors, 1410 (35.6%) eventually had an eGFR<60 ml/min per 1.73 m2 at a median age of 56.6 years and a median time of 9.2 years from donation; 428 (10.9%), <45 ml/min per 1.73 m2; and 101 (2.6%), <30 ml/min per 1.73 m2 at age 68.4 and after a median time of 23.9 years since donation. An eGFR<60 ml/min per 1.73 m2 was associated with older age at donation (HR, 1.05; 95% CI, 1.04 to 1.06), a higher BMI (HR, 1.03; 95% CI, 1.01 to 1.04), a higher baseline systolic BP (HR, 1.01; 95% CI, 1.00 to 1.01), and type 2 diabetes in the recipient (HR, 1.52; 95% CI, 1.13 to 2.03); P<0.001 for each (Table 2). In contrast, a decreased risk of eGFR<60 ml/min per 1.73 m2 was associated with a lower baseline diastolic blood pressure at donation (HR, 0.99; 95% CI, 0.98 to 1.00), being related to the recipient (HR, 0.56; 95% CI, 0.48 to 0.65), and a higher eGFR at donation (HR, 0.98; 95% CI, 0.98 to 0.98); P<0.001 for each. 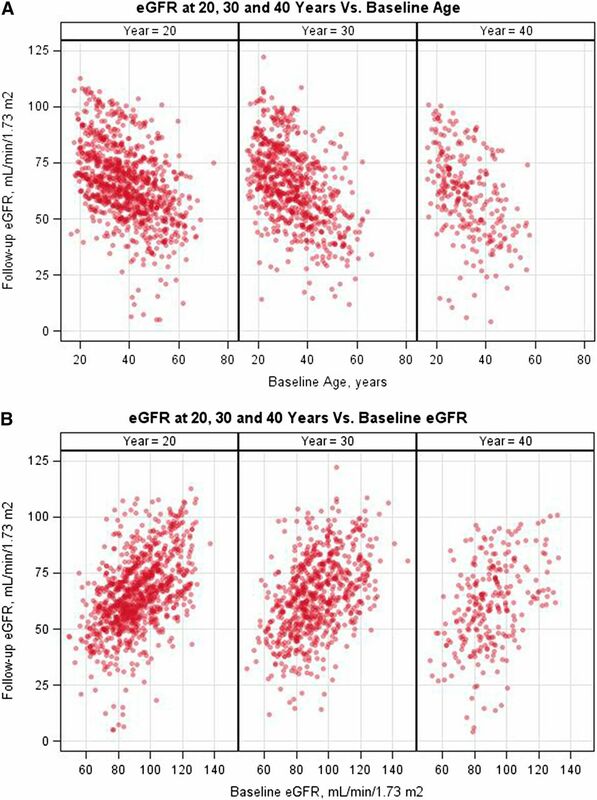 An eGFR<45 ml/min per 1.73 m2 was associated with older age at donation, a higher BMI, and a higher baseline systolic BP; in contrast, being related to the recipient and a higher initial eGFR were associated with a lower risk. For an eGFR<30 ml/min per 1.73 m2, only older age and a higher BMI were associated with increased risk. 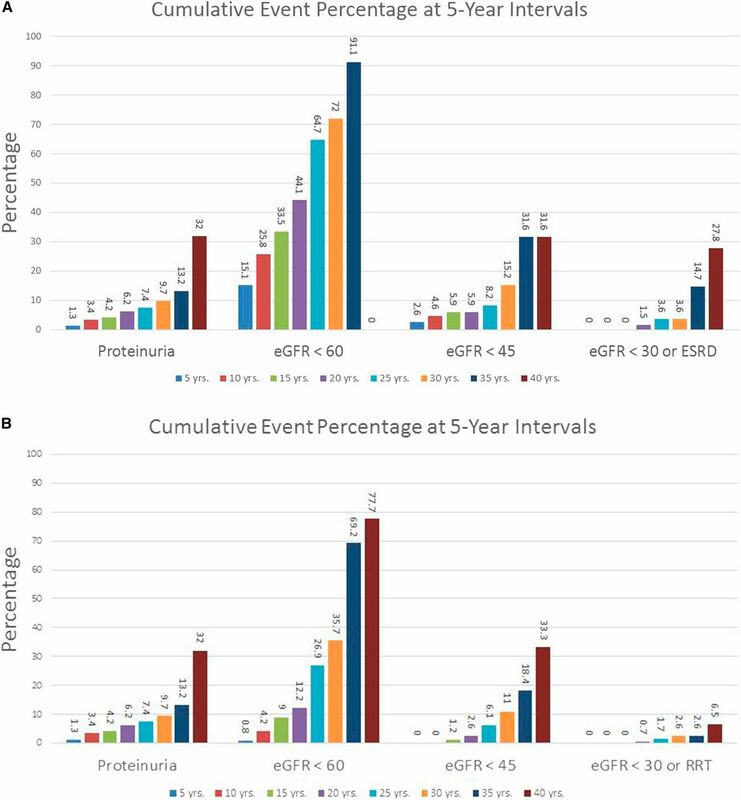 The composite end point of eGFR<30 ml/min per 1.73 m2 or ESRD was experienced by 112 donors at a median age of 68.3 years and at a median of 24.1 years after donation. This end point was associated with older age (HR, 1.07; 95% CI, 1.05 to 1.09; P<0.001), a higher BMI (HR, 1.08; 95% CI, 1.04 to 1.13; P<0.001), and a higher baseline systolic BP (HR, 1.02; 95% CI, 1.0 to 1.04; P<0.01). Regarding ESRD development, 28 donors needed dialysis, underwent a kidney transplant, or were placed on the deceased donor waiting list for a transplant (mean age 61.9±14.1 years, and mean 25.8±9.1 years postdonation). The overwhelming majority (96.4%) of donors who developed ESRD were related to the recipient. Causes of donor ESRD included immune-mediated disease in eight (29%) (glomerulonephritis in five, hemolytic uremic syndrome in two, scleroderma in one), diabetes in five(18%), hypertension in two(7%), renal cancer in one(4%), and cardiomyopathy in one(4%), and was unknown in 11(39%). For donors developing ESRD, the primary causes of disease in the recipient were diabetes (25%), glomerulonephritis (25%), other (43%), and unknown (7%). The cumulative incidence of ESRD per 10,000 donors at 15, 30, and 40 years postdonation was 13.5 (95% CI, 5.1 to 35.9), 68.7 (95% CI, 42.2 to 112.0), and 78.7 (95% CI, 48.3 to 128.2), respectively (Table 3). Figure 1 depicts the relationship between eGFR or age at donation and eGFR from most recent follow-up. A higher baseline eGFR and younger age were highly associated with a better postdonation eGFR. The relationships between systolic BP, diastolic BP, BMI, and serum glucose at donation are shown in Supplemental Figure 1. Figure 2 depicts the Kaplan–Meier estimates of time to developing hypertension, proteinuria, eGFR<60 ml/min per 1.73 m2, eGFR<30 ml/min per 1.73 m2, eGFR<30 ml/min per 1.73 m2 or ESRD, and ESRD alone. Higher baseline eGFR and younger age were highly associated with a better postdonation eGFR. (A) Relationship between age at donation and eGFR at 20, 30, and 40 years postdonation. (B) Relationship between donation eGFR and eGFR at 20, 30, and 40 years postdonation. Cumulative risk of reduced GFR and proteinuria. Kaplan–Meier time to development of hypertension, proteinuria, eGFR<60ml/min per 1.73 m2, eGFR<30ml/min per 1.73 m2, eGFR<30ml/min per 1.73 m2 or ESRD, and ESRD alone. Donors with diabetes and hypertension were matched with donors without these two conditions on age, gender, baseline BMI, and number of years from donation in order to study the specific effect of these two conditions on eGFR change. Donors with diabetes experienced 0.14 ml/min per year change (95% CI, 0.05 to 0.24) before diabetes development, and −0.48 ml/min per year (95% CI, −0.62 to −0.34) after its development. Their matched controls without diabetes experienced 0.05 ml/min per year change (95% CI, −0.06 to 0.15) before the index date of diabetes, and −0.42 ml/min per year (95% CI, −0.66 to −0.80) after. These rates were not statistically different between patients with diabetes and controls. For donors with hypertension, pre- and postdonation hypertension development rates were −0.03 (95% CI, −0.40 to 0.34) and −0.26 (95% CI, −0.38 to −0.13), respectively. In their matched controls without hypertension, they were 0.32 ml/min per year (95% CI, 0.00 to 0.65) and 0.06 (95% CI, −0.08 to 0.21), respectively. Therefore it does not appear, at least in donors with serial measurements, that rate of GFR change is accelerated in donors with diabetes and hypertension. Postdonation diabetes more than doubled the risk of eGFR<30 ml/min per 1.73 m2 or ESRD (HR, 2.41; 95% CI, 1.42 to 4.09; P=0.001); postdonation hypertension produced a similar magnitude of increased risk of eGFR<30 ml/min per 1.73 m2 or ESRD (HR, 2.79; 95% CI, 1.55 to 5.03; P<0.001; Table 4). In addition, developing proteinuria (HR, 4.11; 95% CI, 2.04 to 8.26; P<0.001) and an eGFR<60 ml/min per 1.73 m2 (HR, 4.22; 95% CI, 2.65 to 6.71; P<0.001) postdonation were both associated with a fourfold increased risk of eGFR<30 ml/min per 1.73 m2 and ESRD. The development of postdonation hypertension, proteinuria, eGFR<60ml/min per 1.73 m2, eGFR<30 ml/min per 1.73 m2, and ESRD were all associated with a two- to fivefold increased risk of death. Figure 3 depicts our dynamic spreadsheet-based approach summarizing cumulative risk, in 5-year intervals (up to 40 years postdonation), for any value of the variables associated with our study outcomes. Such a risk calculator could be shown to potential donors at the time of evaluation. As seen in Figure 3A, the 20-year risk array for a donor representing the average donor in our cohort (i.e., a 40-year-old white female nonsmoker with an eGFR of 94 ml/min per 1.73 m2, serum glucose 93 mg/dl, BMI 26 kg/m2, baseline BP 120/73 mmHg, and related to a recipient who does not have type 2 diabetes) would be as follows: proteinuria 6.2%, eGFR<60ml/min per 1.73 m2 44.1%, eGFR<45ml/min per 1.73 m2 5.9%, and eGFR<30 ml/min per 1.73 m2 or ESRD 1.5%. In an otherwise identical situation for a 20-year-old woman whose recipient does have type 2 diabetes, the 20-year risk array would be as follows: proteinuria 6.2%, eGFR<60ml/min per 1.73 m2 12.2%, eGFR<45ml/min per 1.73 m2 2.6%, and eGFR<30 ml/min per 1.73 m2 and ESRD 0.7% (Figure 3B). A live version of this calculator can be found in the Supplemental Material. Risk of main renal outcomes in 5-year increments. Dynamic spreadsheet-based approach summarizing cumulative risk in 5-year intervals. (A) Sample output for an average white donor (i.e., a 40-year-old white female nonsmoker with an eGFR of 94 ml/min per 1.73 m2, serum glucose 93 mg/dl, BMI 26 kg/m2, baseline BP 120/73 mmHg, and related to a recipient who does not have type 2 diabetes). (B) Sample output for a donor identical to that in (A), but 20 years old, and whose recipient does have type 2 diabetes. Testing the performance of our models in the validation set revealed a C-index of 0.82 (95% CI, 0.78 to 0.86) for eGFR<60ml/min per 1.73 m2, 0.79 (95% CI, 0.71 to 0.86) for eGFR<45ml/min per 1.73 m2, 0.85 (95% CI, 0.68 to 0.97) for eGFR<30ml/min per 1.73 m2, 0.77 (95% CI, 0.65 to 0.88) for proteinuria, 0.82 (95% CI, 0.65 to 0.94) for eGFR<30 ml/min per 1.73 m2or ESRD, and 0.93 (95% CI, 0.59 to 1.0) for ESRD alone. Analysis that included all donors yielded very similar results and is shown in Supplemental Figure 2 and Supplemental Table 1. Our study’s findings suggest that the risk of proteinuria and of reduced GFR in white living kidney donors can be reasonably predicted using demographic and laboratory test values obtained at donation. To our knowledge, this is the first description of a model to predict individual donor risk at the time of evaluation for donation. This model might help potential donors better understand their risks, as well as help health-care providers recommend for acceptance the potential donor with the lowest future risk (an option that is of great importance when multiple potential donors are available for a recipient). Within 10 years postdonation, 36% of our study population had an eGFR<60 ml/min per 1.73 m2, but only 2.6% had an eGFR<30 ml/min per 1.73 m2. Two factors likely contributed to such a seemingly high proportion with an eGFR<60ml/min per 1.73 m2. First, that result might reflect the nature of GFR-estimating models in this population.4We previously showed that only 15% of randomly selected donors had a measured iohexol GFR<60ml/min per 1.73 m2.1,5 We also previously showed that 60% of donors with an eGFR (by the CKD Epidemiology Collaboration [CKD-EPI] equation) <60 ml/min per 1.73 m2had a measured GFR≥60ml/min per 1.73 m2.5 The low prevalence of proteinuria that we found in this study is also highly reassuring. Second, we are now transplanting an older recipient population, as well as accepting older donors (often a spouse or friend). The acceptable eGFR criterion has been lowered for the older donor population; thus, some will have an eGFR<60 ml/min per 1.73 m2 immediately postdonation. A higher BMI was the single predonation variable associated with every adverse postdonation outcome we studied, except for death; in fact, each increase of 1 unit in BMI was associated with a 3%–10% higher risk of proteinuria and reduced GFR. Another potentially modifiable factor, smoking, was associated with an increased risk of death. Both smoking and BMI are potentially modifiable. Additional studies are needed to determine whether modifying those two variables, either predonation or postdonation, could reduce the risks. Our findings are on the basis of a relatively conservative BMI acceptance criterion (≤30 kg/m2). Our findings suggest that the current liberalization of BMI acceptance criteria for donor candidates might need to be reconsidered. Certainly, centers accepting donors with a BMI>30 or >35 should be collecting long-term outcome data for those subgroups. In addition, donors should be counseled on the importance of maintaining a healthy weight postdonation. The prediction models we developed also address the effect of BMI on long-term outcomes in concert with other variables, and the risk calculator we provide here can certainly aid in understanding the differential effect of one variable on future renal outcomes while fully considering other demographic or laboratory parameters. In our study, the 15-year cumulative incidence of ESRD was 13.5 per 10,000 white donors (95% CI, 5.1 to 35.9). Muzaale et al., using US donor registry data, reported a 40% higher incidence or a 15-year cumulative incidence of 22.7 per 10,000 white donors (95% CI, 15.6 to 30.1).2 However, the 95% CIs substantially overlap. Of note, whereas 367 of our donors donated >40 years ago, 1205 donated >30 years ago, and more than 2000 donors had >20 years of follow-up, the median follow-up time provided by the US donor registry was only 7.6 years and the longest follow-up time was 15 years. For our study population, the 15-year cumulative incidence of ESRD translates to 90 per million per year, which is lower than the rate of ESRD in the general US population of 276 per million per year.6 The ESRD rate at 40 years postdonation, however, was 524 per million per year. In a study of living kidney donors (also all white) in Norway, Mjoen et al. reported that nine developed ESRD at a median of 15.1 years of follow-up—yielding an incidence of 302 per million per year.3 In the Norwegian study, all of the ESRD occurred in donors who were related to the recipient; the cause of ESRD was immunologic disease in six, sarcoidosis in one, and diabetes in two. In our study, the majority of donors who developed ESRD were also related to the recipient. However, being related was associated with a 42%–47% lower incidence of proteinuria, of an eGFR<60ml/min per 1.73 m2, and of an eGFR<45ml/min per 1.73 m2. The predominance of relatives, in both the Norway cohort and ours, developing ESRD might be, in part, because they have the longest donor follow-up time, because unrelated donation was rare before the mid-1980s. Alternatively, in the general population, we know that the blood relatives of patients with ESRD have an increased risk of developing ESRD.7 Additional studies that provide longer follow-up for unrelated donors will be needed to understand this issue better. In the general population, diabetes and hypertension are the two most common causes of ESRD. Their prevalence appears to be similar in living kidney donors and healthy controls.1,8 We previously compared donors to their nondonor siblings and found a similar rate of hypertension.9 In this study, we found that both de novo diabetes and hypertension were highly associated with proteinuria and reduced GFR. Clearly, living kidney donors should have regular follow-up; these conditions should be aggressively treated. Our study has limitations. First, we limited our analysis to white donors. However, white donors make up 75% of all donors in the United States; therefore, predonation information is important for this population.10 Nonetheless, our models need to be validated in other long-term donor cohorts. Second, diabetes, hypertension, and proteinuria were self-reported and only verified in those who provided laboratory testing, a list of their medications, and records from their physicians; roughly 60% of all donors. Although the concordance of self-reported drug-treated diabetes and hypertension with medical record abstraction is excellent, the magnitude of concordance for proteinuria is not known.11,12 Lastly, that the changes in donor characteristics over time have influenced the results is certainly possible. We have recently shown that donors in earlier eras were younger, and were less likely to be glucose intolerant or obese.13 These changes, however, were very small and unlikely to have introduced bias in our results. In all, continued thoughtful and stringent screening of potential kidney donors is effective in minimizing donor risks, because proteinuria, severe reduction in eGFR, and ESRD continue to be uncommon. Similar to the situation with nondonors, diabetes and hypertension were powerful predictors of those outcomes. Renal outcomes can be predicted with reasonable accuracy using information available at the time of donor evaluation. Such a risk calculator could enhance donor counseling about risks. From June 1963 through September 2013, we performed 4187 living donor nephrectomies. Of these living kidney donors, 3956 (95%) were white. Therefore, we restricted the analyses to white donors. Identical analyses were, however, carried out in our entire donor population. Exclusion criteria for donation included any proteinuria; hypertension; BMI>30 kg/m2 unless physical examination results warranted acceptance; and elevated fasting glucose levels, or, in potential donors with fasting glucose levels in the prediabetic range, abnormal glucose tolerance test results. Of importance, the definitions of hypertension and diabetes have changed over time; potential donors were accepted according to the extant definitions. In the early years of our study, hypertension was an absolute contraindication to donation. More recently, we have accepted donors >55 years of age whose hypertension was well controlled with a single drug and who had no evidence of end-organ damage. Postdonation, with consent, we follow our living kidney donors indefinitely. For our study population, laboratory and demographic variables are entered into our database at donation. Donors are contacted at 6, 12, and 24 months, and then every 3 years, postdonation. At each contact, donors are asked about hypertension and diabetes requiring treatment (see Supplemental Material). For quality control, we cross-validate the most recent survey with previous ones, in order to address consistency regarding self-reported conditions. For the purposes of this study, we used the earliest date of problem onset. Donors are also asked to provide recent laboratory test results and copies of records (or, if not done, to have these tests); alternatively, with donors’ permission, we contact their local clinics for recent history, physical examination notes, and laboratory test results, including serum creatinine, glucose, urinalysis, and urinary protein measurements. This study was approved by the University of Minnesota Institutional Review Board (HSC #0301M39762). Donors were consented as appropriate and all procedures were performed in accordance with the Declaration of Helsinki. We studied the postdonation risk of proteinuria and reduced eGFR. We defined proteinuria by a urinary albumin excretion rate >30 mg/g creatinine, 24-hour urinary protein>200mg/d, ≥2+ on urine dipstick tests, or by donors’ self-report. For reduced eGFR, the cutpoints were those typically used to stage CKD (<60, <45, and <30 ml/min per 1.73 m2); we also used the composite endpoint of eGFR<30 ml/min per 1.73 m2 or ESRD (defined by needing dialysis, undergoing a kidney transplant, or being placed on the deceased donor waiting list for a transplant).14 Using that composite endpoint minimized the disadvantage of studying a rare event like ESRD and took advantage of the fact that an eGFR<30 ml/min per 1.73 m2 almost uniformly (except in the case of acute renal injury) precedes ESRD development. To calculate the serial eGFR, we used serum creatinine levels and the CKD-EPIequation.15 We repeated all study elements by using the Modification of Diet in Renal Disease (MDRD) study equation: findings were similar, so we will not show our MDRD data. We previously showed that the CKD-EPI equation was more precise (than the MDRD study equation) in living kidney donors who underwent postdonation iohexol GFR measurement.5 Diabetes was determined from donors’ self-report of treatment with diet, oral agents, or insulin; and new-onset hypertension by use of antihypertensive agents. Donors provided the name and start date for antidiabetic and antihypertensive agents. For all clinical outcomes, we censored follow-up on December 31, 2013; additional censoring points for nonfatal clinical outcomes included the latest clinical encounter. The sole additional censoring point for eGFR below specific thresholds was the date of the latest serum creatinine measurement. One of the objectives of this study was to develop reproducible risk prediction models, so we considered three datasets: the primary dataset (n=3956) and two other datasets generated by randomly dividing the primary dataset equally into a development cohort and a validation one. The development and validation cohorts were comparable (see Supplemental Material). To describe baseline characteristics of our study population, we used analysis of variance. To compare those characteristics in the validation and development cohorts, we used chi-squared analysis. Having determined that model performance was similar in all three datasets, we derived our subsequent analyses from the primary dataset. Risk factor candidacy was predicated on a stepwise proportional hazards regression approach, with P<0.05 to consider and maintain candidacy. Covariates considered included age, gender, systolic BP, diastolic BP, race, BMI, fasting serum glucose level, smoking, relationship to the recipient, cause of ESRD in the recipient, and donor baseline eGFR. To estimate the HR for our clinical outcomes of interest, we used the stepwise regression model; to assess the discrimination performance of our final models, we used the Harrell C-index.16 To assess model calibration, we compared the disparity between observed and predicted risk for each quintile of predicted risk, using the D’Agostino and Nam chi-squared statistic (P>0.05 for each outcome reported here).17 To calculate a subject-level risk score for each outcome, we used regression coefficients from each model; then, we used the 5th to 95th percentile of the distribution of those scores to assemble 20 score groups. Finally, we used survival analysis to calculate the cumulative incidence of the event of interest in each group. To quantify associations between clinical events postdonation (such as diabetes, hypertension, and other outcomes of interest), we treated those events as conditional time-dependent covariates, using proportional hazard regression. To generate simple, dynamic graphic risks for donors with differing risk profiles, we used model coefficients and Excel spreadsheet VLOOKUP functions. For all data analyses, we used SAS, version 9.4 (SAS Institute Inc., Cary, NC). The authors would like to thank Robert Bailey, Kathryn Long, Jody Rincon, Amy Pagett, Lindsay Buckmeier, Monica Myers, Kelsey Bills, Amanda Kraus, Leeta Gnotsavath, and the numerous other staff members and students from Transplant Information Services and Transplant Research Organization at the University of Minnesota for their dedicated follow-up of living donors. Funding for this research was provided by the National Institutes of Health (NIH) as part of the Program Project Grant Studies of Organ Transplantation in Animals and Men (5P01 DK013083). The NIH had no role in study design, analysis, or preparation/review of the manuscript. This article contains supplemental material online at http://jasn.asnjournals.org/lookup/suppl/doi:10.1681/ASN.2015091018/-/DCSupplemental.